CCCC系列讲座之二:The College Search. 讲演人: Larry Dannenberg.时间: 2010年10月17日 上午10-12. Ceremony of raising national flag will be held to celebrate the 61st Anniversary of PRC in front of Boston City Hall on Sept. 25, 2010. Click here for details. A Long Distance Training Course - 4th of the 2010 Spring Series - Personal Health Care in Summer is scheduled on June 18th. Click here for details. CCCC Student Committee will host a bake sale at 9:00AM-1:30PM, May 22nd & 23rd for the benefit of Dandelion Migrant School in Beijing, China. Click here for details. A Long Distance Training Course - 3rd of the 2010 Spring Series - for Chinese Teacher is scheduled on May.14th. Click here for details. Greater Boston Chinese communities will host a benefit performance for Yushu Earthquake Relief on April 24, 7:00PM at CCCC facility. Click here for details. 11 CCCC students received perfect score at 2010 Chinese Culture Knowledge Contest. Click here for details. CCCC Calls for donations to Yushu Earthquake Relief. Click here for details. A Long Distance Training Course - 2nd of the 2010 Spring Series , Personal Health Care in Spring - is scheduled on April 17th. Click here for more information. Important message about College Students China Summer Activities. Click here for details. China Visa Service with special discount will come to CCCC again. Click here for details. CCCC and a group of children with their parents will host a fundraiser for Haiti Earthquake Relief on March 27th, 2:30pm - 4:30pm. Click info | flyer for details. 2010 "Tracing Our Roots" Summer Camps in China now start taking registration. A Long Distance Training Course - 1st of the 2010 Spring Series - for Chinese Teacher is scheduled on March.26th. Click here for more information. At many parents' request, some new classes are scheduled to open. Click here for more details. Four new workshops have been scheduled. The first one will be on Feb. 21. Click here for more details. 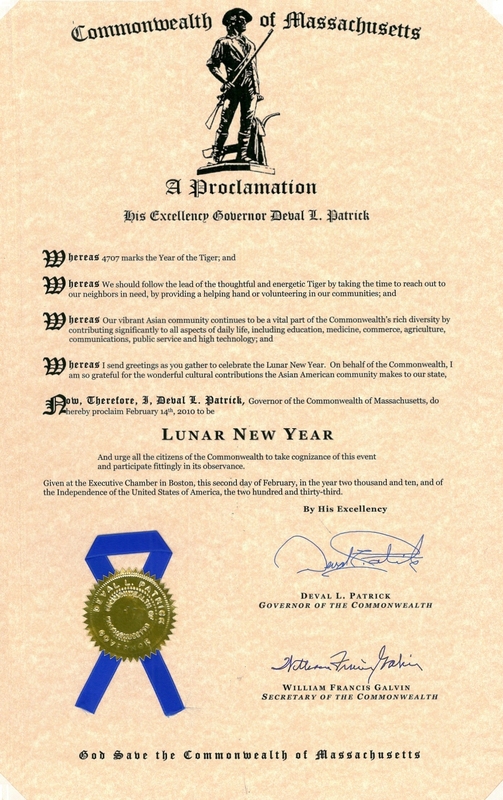 Massachusetts Governor Deval L. Patrick has sent a personal Lunar New Year greetings to Asian communities in the commonwealth. Click here to read it. CCCC will be hosting the Annual Chinese New Year Celebration on Saturday, February 27, 2010. The party will start at 2:30PM at McKenzie Auditorium, MassBay Community College in Wellesley Hills. Please click here for details and directions. Second Chinese Culture Knowledge Contest will start on Feb 28th, 2010. Click here for detailed information. CCCC has just launched a new Mentorship Program. Click here for more information.